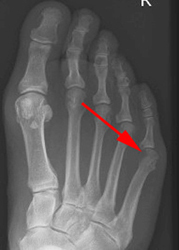 A bunionette is a bony prominence on the lateral (outer) border of the foot, close to the base of the little toe. It is similar to a bunion of the big toe and can be as symptomatic. The bunionette can rub in shoes and cause pain, swelling, callosity and occasionally an ulcer if improper shoes are worn. While not always symptomatic, the primary treatment of a bunionette is care with appropriate shoe wear. In persistent cases, surgery can be performed to realign the bone and remove the prominence. 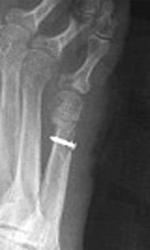 In persistent cases, surgery can be performed to realign the bone and remove the prominence.